Xiaomi Malaysia is making a range of new products available in one of their usual limited time sales just in time for the Chinese New Year celebrations. Most importantly, the Xiaomi Mi Pad and Redmi Note 4G are also being made available during this time, which starts at 12pm today. The first batch of Xiaomi Mi Pad sold out in just over a minute, which is a bit faster than most users were capable of clearing the checkout. There is no word on how many tablets are being made available this time around, but potential buyers should be prepared for another ridiculously short window of availability. On the other hand, the Redmi Note 4G has not been offered for sale by Xiaomi for a very long time and the phablet will make its return to the online store at the same time as the Mi Pad. Despite this, most telcos have been offering the Redmi Note 4G as part of a package deal since its release; with this in mind, there should not be too much rush to buy this particular device. Along with the two devices, Xiaomi Malaysia is also releasing five accessories for sale. These are: Mi In-Ear Headphones (RM 99), Mi Bunny Screen Cleaner (RM 16), two different USB Cables , and a 5000 mAh Mi Power Bank (RM 34). 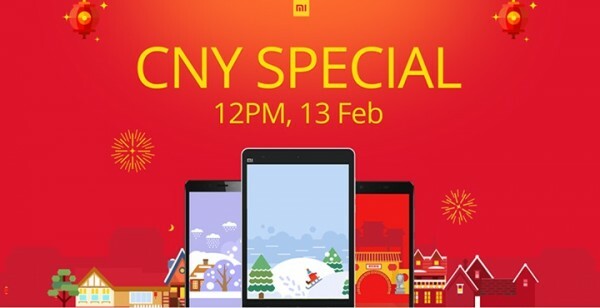 There is also a contest being run on the CNY Special Sale, and Xiaomi fans are asked to share and comment on the official Facebook post. The most creative comment will win an unspecified CNY Gift Pack, although the company says that there will be consolation prizes given out as well. The contest runs until 12pm on 14 February, which means there will be less of a rush than buying the devices. Finally, Xiaomi notes that there might be a slight delay in deliveries due to the festive season and asks that its fans be patient. It will still try to fulfill all the orders within the usual time frame, but customers buying anything between 13 and 21 February should be prepared to receive their purchases a little late.